We would like to take this opportunity in introducing “SIDDHAPURA ENTERPRISE” (ISO 9001:2008 Certified Company), as one of the leading manufacturer of Radial & Pillar type Drilling Machine in Bhavnagar, Gujarat, INDIA. SIDDHAPURA ENTERPRISE is a leading global name in the drill industry. Main spindle made from alloy steel with 6 slots is machined by hobber machine and MT-Bore is provided internally grinded by internal grinding machine. Top cover provided with window for changing gears and setting VBelt for desired R.P.M. 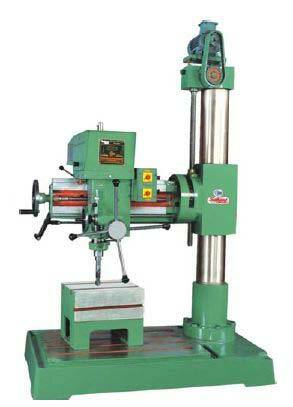 Pillar & other parts being provided in machine are ground and finished by WMW GERMAN MAKE GRINDING MACHINE. Automatic adjustable depth control. Auto as well as manual feeds. Note : We reserve the right to after of modify dimension design without orior notice.